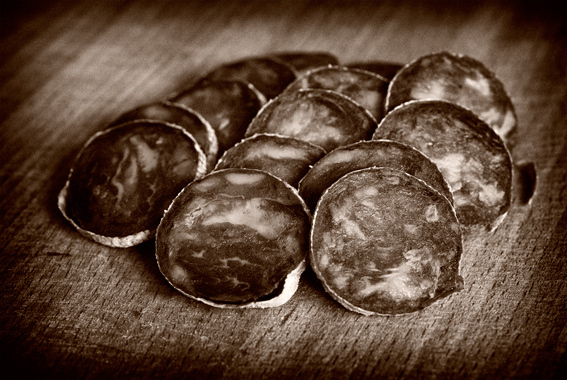 Chorizo de Bellota is a very high quality, cured sausage, made from pata negra (black foot) pigs in Spain. 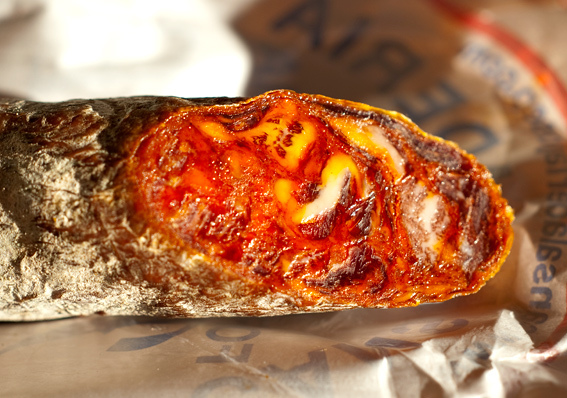 This chorizo is made from Jamón Ibérico, free range Iberian pigs that have been allowed to roam free in oak forests, eating acorns (bellota) and smoked paprika. Bellota signifies that it is the highest quality Spanish ham and pork. This will go really well with cocktails. Apparently, the fat, having been made from acorns, is rich in oleic acid, which is very good for you, just like olive oil! It’s worth noting that in Spain, the letter Z is pronounced like th in English – the Spanish would never say cho-rit-zo – it’s like th in think, cho-ree-th-oh. This entry was posted in Food, Meat, Spanish and tagged acorns, chorizo, Chorizo de Bellota, Jamón Ibérico, oleic acid, paprika, pigs, pork. Bookmark the permalink.